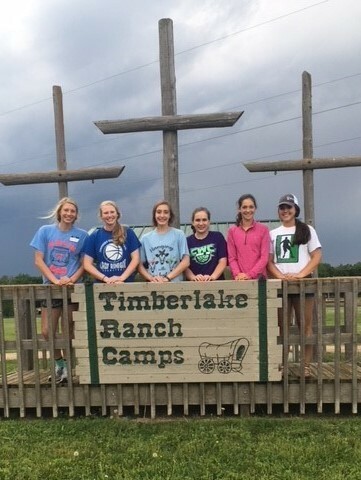 The Chambers FFA Officers attended a retreat at Timberlake Ranch Camp near Marquette, NE from May 29 through June 1. At the camp the officers spent a lot of time planning FFA activities for the year, and bonded through activities such as cooking, boating, swimming and crafts. Each officer set goals for themselves and the FFA chapter. We reviewed each officer’s responsibilities and expectations for the year. The officers got a refresher on how parliamentary procedure works, and they learned their parts of the FFA opening and closing ceremonies. Overall, it was great meeting and getting to know the officers. Brooklynn Burrell and Megan Homolka attended Washington Leadership Conference June 12 – 17. At the conference in D.C. the students met other FFA members from across the United States. They learned valuable leadership skills that they can share with the rest of FFA chapter. The girls also packaged food for their service project. There was many different memorials and museums that the students were able to see. I attended WLC advisory program. I went to many workshops and networked with other ag teachers. I learned many things from this experience and plan on bringing new ideas to the chapter.